More Stone Cottage Architecture . . . StoryStone Style! The stone cottage architecture featured here encompasses an enchanting array of storybook cottages scattered around the world . . . . . from tiny hamlets in the English countryside . . . to the Grand Canyon of North America . . . to the Andes Mountains of Peru! The charming English cottage designs pictured here depict a variety of styles from different eras. In addition to stone, the lovely Tudor cottage at left features stucco and half-timbering. 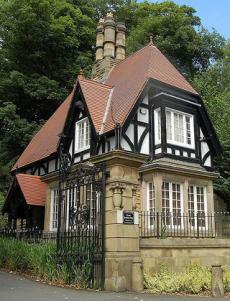 The tiny gatekeeper's cottage pictured below, left, sits at the entrance to an English manor house. Below, right, is a quaint Victorian cottage -- complete with a cottage garden. The stone cottage architecture featured here exudes loads of nostalgic charm. At right is a 15th century miller's cottage. The English cottage pictured below is protected from the elements by a beautiful thatched roof. Moving to the Emerald Isle, the unique structure pictured at right is an Irish garden lodge. Heading south to Recarei, a small town in Portugal, we find the beautiful stacked stone cottage that follows, nestled at the edge of a soothing waterfall. 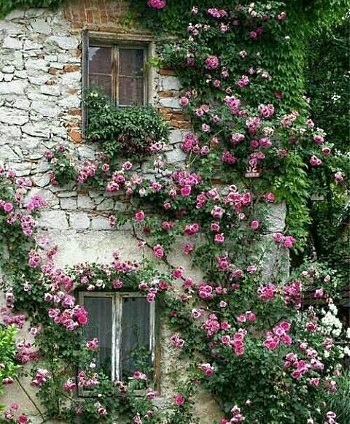 Stone Cottage Architecture in . . .
Hopping "across the pond" to North America brings us to the charming storybook style cottage pictured at right and below. Perched on a rocky outcrop above a tranquil lake, the design is inspired by English cottage architecture, extremely popular in North America during the 1920s and 1930s. Heading to the Northern Rockies brings us to a tiny stone fishing cottage by Miller Architects, pictured below, left. The little rustic stone cottage on the right is believed to be located near the Grand Canyon in the American Southwest. Hopping back across the pond to Southern Europe -- probably Portugal or Italy -- brings us to the charming, well-worn cottage pictured in the lush hillside setting at right. And finally, crisscrossing the Atlantic one more time, we come to the stunning thatched roof stone cottages pictured below. Perched on a terraced mountainside high in the Peruvian Andes, the cottages overlook an absolutely magnificent setting! Please check back often or subscribe to our RSS feed, as we frequently add new images of stone cottage designs to our site.